When it comes to online e-filing, not all options are the same. Choosing the right company to handle your online tax forms is a big decision. You want to ensure that everything is handled in a timely manner and that your forms are all filed properly with the IRS. 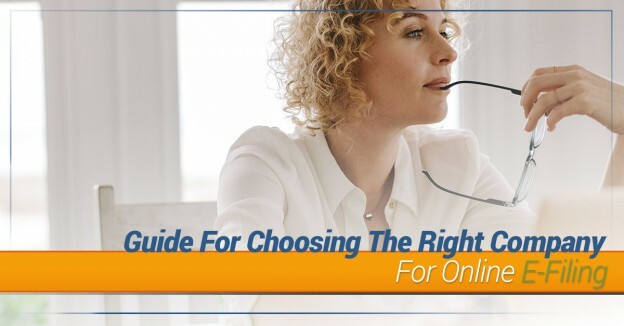 In order to choose the right tax filing website, you will need to spend some time doing research and understanding what specifically you are looking for help with. 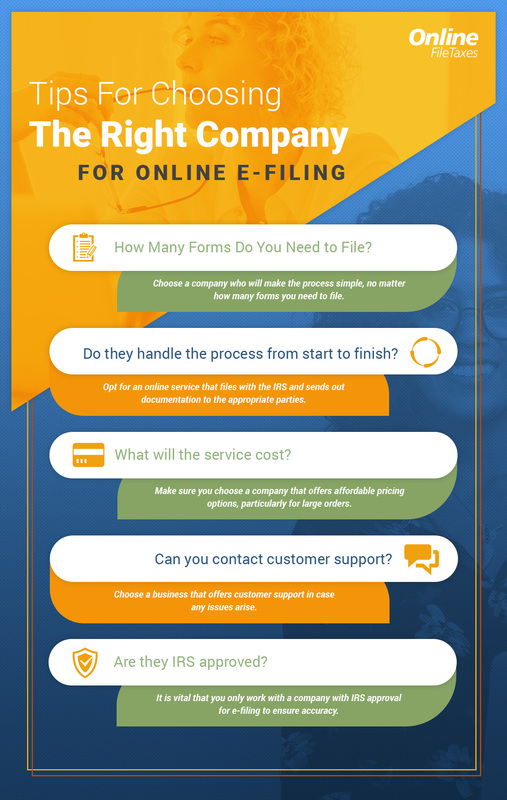 As you go about the process of finding the right company for online e-filing, we invite you to check out the following guide to choosing the ideal service for your needs. Not all businesses have the same needs when it comes to online tax forms. Perhaps you only need to file a handful of 1099s or maybe you are looking to file hundreds at a time. Not all online filing systems can handle large orders and some are specifically designed for massive corporations. Ideally, it is wise to find a company that can handle any amount of tax forms, no matter how large or small. This will allow you to continue to utilize the same platform for years to come, even as your business grows. Sticking with one platform will allow you to spend less time in coming years searching for records and documentation. Some companies will simply sell you packets of 1099s to download and fill out on your own. Others will allow you to prepare them online, but they can’t handle the actual filing process. Make sure you opt for a company that will cover the process from start to finish. For example, you should be able to fill out the forms online, e-file them with the IRS, as well as have copies sent out to the respective parties. Choosing a company that handles every step of the process is convenient and time saving, as well as more cost effective than piecemealing it out. Look for a simple, one-stop platform. Filing hundreds of 1099s can start to add up. Make sure that you look for a company that offers you affordable pricing options if you have numerous forms to file. The less money you can spend on this process the better for your business. Avoid platforms that are designed for massive corporations with higher costs. Many of these platforms have more bells and whistles than you actually need. Don’t waste your money on the unnecessary, instead, look for an affordable platform that meets your basic needs. Does the company you are considering offer any customer support? While ideally, everything will go smoothly and filing will be an error-free process, it is nice to know there is someone you can reach out to for help in case of an issue. Look for a tax filing service that is backed by customer support. Having support when you need it could mean the difference between missing an important deadline or getting your forms in on time. Finally, make sure you opt for a company that is backed by the approval of the IRS. This will ensure that your forms are actually received by the IRS in a timely manner. An IRS approved e-file provider can quickly submit your forms, allowing you to rest easy with a greater peace of mind. Here at OnlineFileTaxes.com, we provide a simple, easy-to-use platform for online e-filing. If you are interested in finding a faster, more effective way to file 1099s, we invite you to sign up for free today. Whether you are filing a couple 1099s or hundreds, our affordable pricing and simple steps will make the entire process less stressful. Reach out today to learn more or visit our Frequently Asked Questions page for more information about our services. This entry was posted in Online E-Filing and tagged 1095 filing, 1095B and 1095C, 1098 E form, 1098-Ma, efile W2, form 1098 mortgage interest, online tax forms, tax filing websites on October 11, 2018 by OFT. 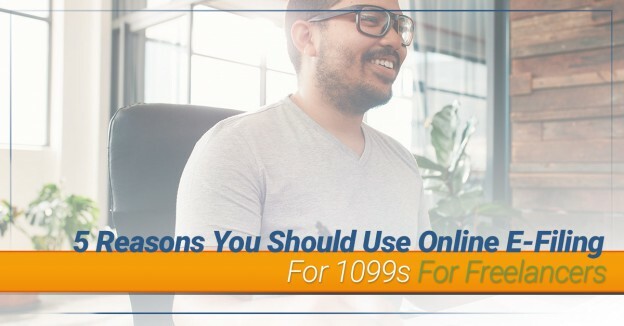 If you are a business owner and you utilize freelancers at any point, you will need to file 1099s before tax season to properly document the payments you have made. A freelancer will then use this 1099 as they go about paying their own taxes. Unlike a regular employee, a freelancer is responsible for paying all the applicable taxes on their income, leaving you without the burden of this cost. While you may benefit greatly from utilizing freelancers, especially during the initial stages of building your business, it is critical that you properly file all necessary 1099s in a timely manner. The good news is that while this task was once a cumbersome, laborious matter that could only be handled manually through pen and paper, it is now something that can be simplified and streamlined through online e-filing. 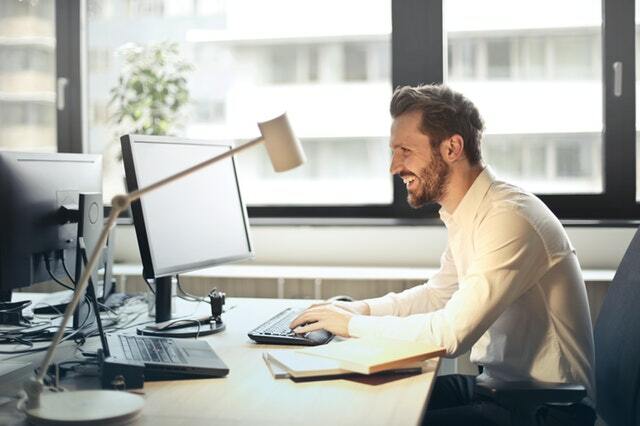 If you are interesting in utilizing our online platform for filing 1099s for freelancers you employed over the past year, check out the following five reasons why this switch will benefit your company. When it comes to filing every single tax form necessary, the process can quickly become a chaotic and convoluted mess. The fewer stacks of paperwork you have piling up on your desk the better. By converting over to online e-filing, you can cut down on the risks involved during tax season. It is easy to misplace paperwork, forget to file 1099s, or completely skip steps, such as mailing the 1099 to the freelancer in question when you handle everything the old-fashioned way. When you e-file 1099s, the process is simple and the risks are mitigated. You fill out the information through a secure online platform. The 1099 is automatically filed with the IRS for you and a copy is sent to the appropriate recipient. Meanwhile, you have access to all the records online and you save yourself from drowning in yet another sea of paperwork. When it comes to operating a small business, your time is invaluable. 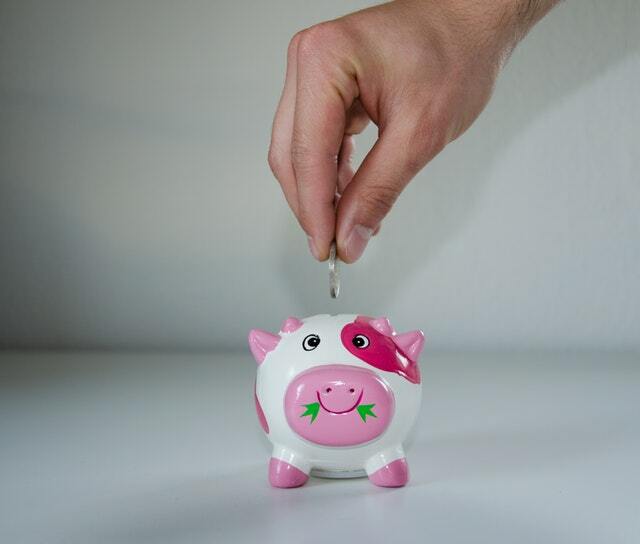 The more time you spend sifting through documents and filling out lengthy forms, the less time you have to invest in other valuable assets of your business. In this sense, your time truly is money. When you opt for a faster process in any part of your business, you reap the reward across the business as a whole. Online e-filing saves you a large amount of time, which means you are saving money by utilizing technology to your advantage. Instead of hours wasted purchasing forms, filling them out, manually mailing them, and manually filing them with the IRS, you can quickly and effectively complete all these steps at once. With this faster process, you free up time that can be utilized for other valuable tasks. The only question that remains— what will you do with all this extra time? Do you have a tendency to procrastinate tasks? Many of us struggle to handle things in a timely fashion, which can often lead to forgetting about a task entirely. When it comes to filing 1099s and ensuring they are in the hands of freelancers and contractors by the appropriate deadline, forgetfulness can be a disaster. When you utilize online technology to e-file, everything happens right away. You don’t have to worry about a stack of forgotten papers on your desk that you remember in a panic at 1am while you lie awake in bed. Through OnlineFileTaxes.com, you can access the forms you need. Fill everything out simply and quickly. Then, once you check out, your forms will be e-filed with the IRS. The appropriate copies will be sent to the right recipients for you as well and everything is accessible for you through your online portal. Because of how simple this process is, you don’t have to panic about forgetting an important step. It is all handled for you in the blink of an eye. Let’s face it. There are countless softwares on the market that help with taxes and filing. However, many of these softwares are cumbersome, costly, and extremely difficult to navigate. This can make the process more time-consuming rather than simpler. When you just want to file 1099s for freelancers you utilized, less is actually more. Choosing an online tool, such as OnlineFileTaxes.com, means that you can quickly and efficiently accomplish the task you need to without jumping through a thousand other hoops. This can also cut out the need for administrative and IT costs associated with 1099 processing. You can handle the task on your own, in a quick fashion, ensuring your freelancers receive their forms on time and you submit your 1099s to the IRS before the January deadline. The best part? It is extremely affordable to file 1099s through our online platform. As an approved e-file provider with the IRS, we take pride in how simple and quick we have made this once cumbersome process. Finally, when you handle filing 1099s for freelancers in a timely and effective manner, you will have happier freelancers. The freelancers who do work for you need to be able to handle their own taxes in a timely manner and by having the 1099s they need in hand, they can finalize their filing as well. This leaves a positive impression on the freelancers you use and builds a professional relationship. If you plan to rehire freelancers in the future for more work, ensuring you provide them with necessary documentation in a professional method will go a long way in incentivizing them to work for you again. Are you interested in online e-filing for 1099s for freelancers? We can help. Utilize our simple online platform and you can file all the 1099s you need to in one easy place. Whether you are filing a few 1099s or hundreds, our platform will make the entire process simple, smooth, and affordable. Reach out today with any further questions about how online e-filing works. This entry was posted in Online E-Filing and tagged 1095 filing, 1095B and 1095C, 1098 E form, 1098-Ma, 1099s for freelancers, efile W2, form 1098 mortgage interest, online tax forms, tax filing websites on September 13, 2018 by OFT.